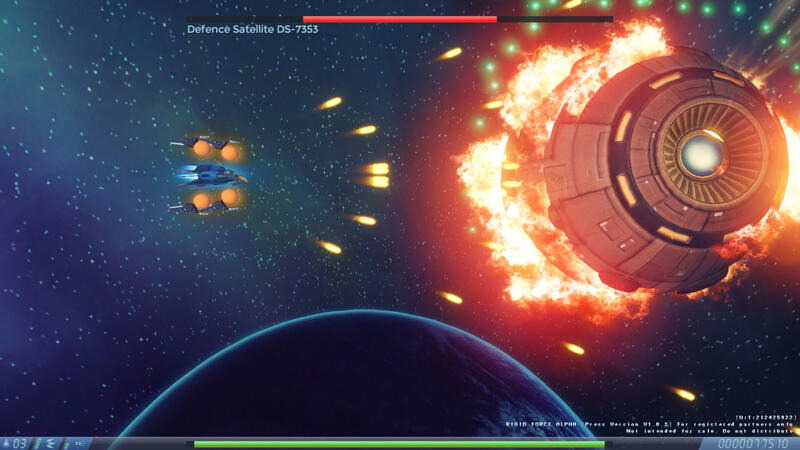 Rigid Force Alpha is an arcade-styled, space-themed shoot ‘em up where you get to pilot the most advanced interstellar and planetary spaceships ever in the United Planet Freedom Forces’ (UPFF) arsenal. With the controls in hand, you set off on a mission to help save UPFF’s research stations from attack, but naturally, things are actually a lot direr than it seems, resulting in a full-blown adventure across various planets where you’ll have to battle superior mechs and AIs as well as unique alien lifeforms spawned from the research they were conducting. The game begins with a tutorial where you may pick up some tips you may otherwise have to find out yourself through multiple unnecessary game-overs. The tutorial is fairly short and succinct, and once you’re done, you’ll be shooting at enemy spaceships and aliens in no time! However, you should know that Rigid Force Alpha falls into the category of games where it is somewhat easy to learn, but can be pretty tough to master. So, you may still find the game a bit tough at first, even if you know, generally, how to play the game. Like most space arcade shooters, you will be able to switch between the different types of weapons as long as you pick them up. There are several for you to equip, and although technically all of them should work similarly when it comes to decimating your enemies, some weapons are simply a lot more effective than others. It all boils down to the type of enemy you are facing and on the game environment. All of these features are pretty common in any game within the same genre, but Rigid Force Alpha went above and beyond, adding in several new features, such as the ability to use charged attacks, which again, varies depending on the type of main weapon you have on. 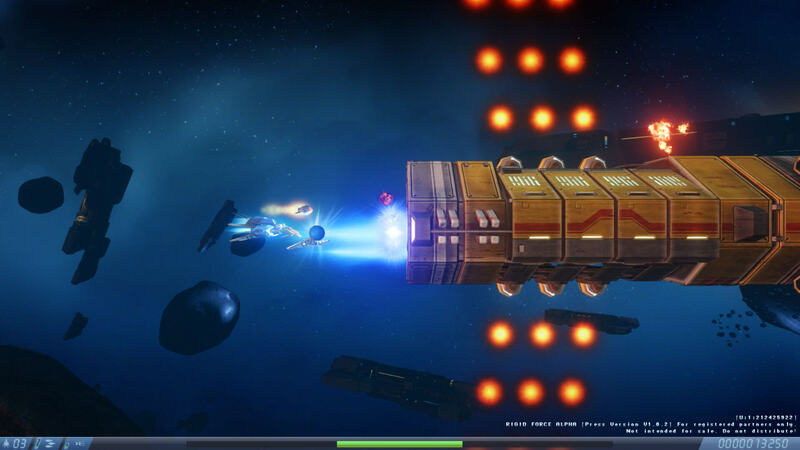 There’s also a Bullet Blade ability which you can activate using the left Shift key that helps to protect your spaceship from enemy projectiles for a short duration of time. Both charged attacks and Bullet Blade drain your energy bar though, but you can easily fill it right up again by defeating your enemies and collecting the energy orbs they left behind. P/S: Use Spacebar to attract the orbs to you. Trust me, that’s the easiest way. You can even amplify your combat capability by collecting and equipping up to 4 Force Shards. Generally, they add more projectiles to your every shot, but what’s more interesting is that you can switch the position of these shards, allowing you to either spread your shots out a bit more or fire at enemies behind you as well. These added features are not only a way for the developers to show their innovative side, but these features are crucially needed to defeat some of the more special enemies you’ll encounter. The game starts you off with the Main Mission where you will attempt to get through all the stages in a single sitting just so you can uncover the plot of the next stage. Yes, you heard right – if you get a game over after using up all your 4 lives, you actually have to play the mission all over again right from the start. 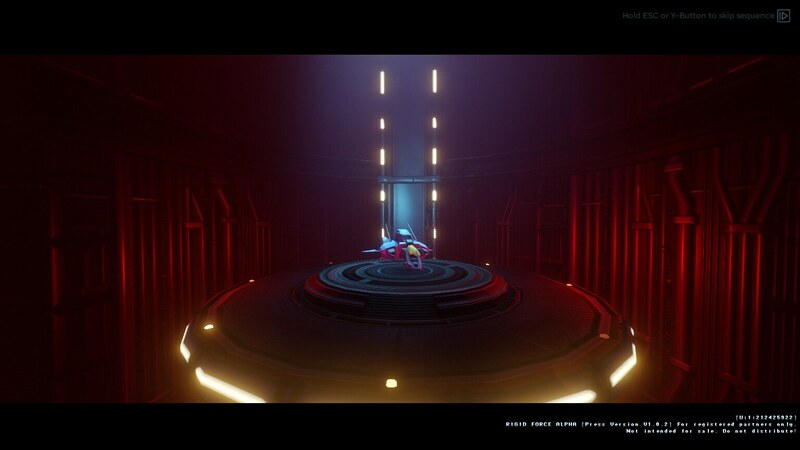 Thankfully, you can use Credits to start over from the stage you last died in as opposed to starting from stage 1. You only have a limited number of credits though. As you progress through the main missions, you will also unlock new game modes – there are two. I didn’t manage to unlock the second one, but the first game mode is the arcade mode. It basically allows you to replay the stages you’ve passed in the main mission but with different objectives and scoring systems. In terms of graphics and sound, Rigid Force Alpha has some fantastic graphics and visual effects that draw you into all the hectic shooting and also the gorgeous alien worlds that you’ll be flying through. However, in my opinion, all of this pale in comparison to the techno-styled background music. Besides being catchy as hell, I find that the music has a really distinct and interesting sound to it that truly sets it apart from the usual stuff you hear when playing a game of this genre.